This 2,333-sf, three-story home is located within the private golf community of Brier Creek CC at 10330 Sablewood Drive. It features an open floor plan and is scheduled to be move-in ready in September 2019. Make your new home reflect your tastes by taking advantage of the option to select your own custom finishes. Send me more about this home in Brier Creek! Situated in the heart of the sought-after Triangle area, Brier Creek Country Club is adjacent to the Research Triangle Park and just minutes from downtown Raleigh, Durham, and Chapel Hill. This fabulous community also offers you a wealth of amenities. The 18-hole Arnold Palmer Signature Golf Course at Brier Creek Country Club is unparalleled among Raleigh golf courses. Send me more about this home in Brier Creek! In addition to professional-caliber golf, you’ll have access to a magnificent 40,000-square-foot clubhouse complex including tennis, swimming, fine and casual dining, a fitness center, business amenities, and much more. 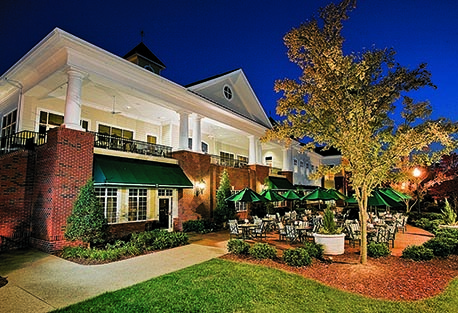 Brier Creek Country Club combines a warm neighborhood lifestyle with the finest in golf and country club elegance, all set in the sublime North Carolina atmosphere. Named after golf course designer Arnold Palmer’s late father, Deke’s Grille provides casual dining with a seasonal opportunity to have a meal outside overlooking both the signature 18th hole island green and the beautiful Jasmine Court, the outdoor wedding lawn. In the evening, you can socialize or dance the night away in the grand ballroom. Exciting activities and events are always happening here. Send me more about this home in Brier Creek!